I've got an Xbox One that I love that is connected to a DirectTV HDTV Receiver that I love somewhat less. The setup is quite simple. Since I can control the DirectTV with the Xbox One and we like to switch between Netflix and Hulu and DirectTV we use the Xbox One to control everything. The basic idea is this, which is quite typical with an Xbox One. In theory, it's amazing. However, this doesn't always work. Often you'll turn on the whole system and the Xbox will say "Your TV Signal was lost. Make sure your cable or satellite box is on and plugged into the Xbox." This got so bad in our house that my non-technical spouse was ready to "buy a whole new TV." I was personally blaming the Xbox. It turns out that's an issue of HDMI compliance. The DirectTV and other older cable boxes aren't super awesome about doing things the exact way HDMI like it, and the Xbox is rather picky about HDMI being totally legit. So how do I "clean" or "fix" my HDMI signal from my Cable/Satellite receiver? I took at chance and asked on Reddit and this very helpful user (thanks!) suggested an HDMI splitter. I was surprised but I was ready to try anything so I ordered this 2 port HDMI powered splitter from Amazon for just US$20. It totally works. 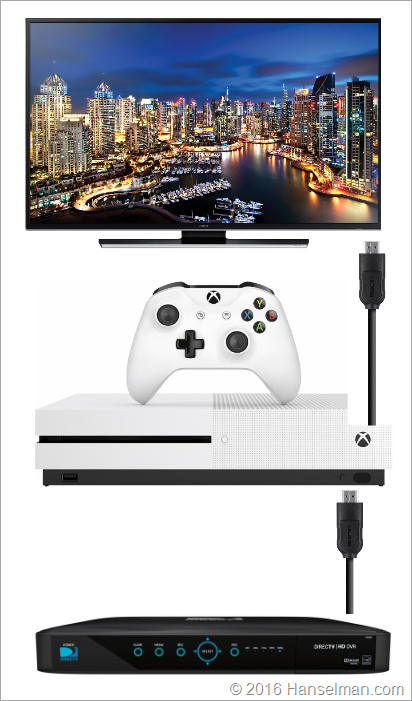 The Xbox One now does its "negotiations" with the compliant splitter, not with the Receiver directly and we haven't seen a single problem since. If you have had this problem with your Xbox One then pick up a 2 port HDMI powered splitter and rejoice. This is a high quality splitter than doesn't change the audio signal and still works with HDCP if needed. Thanks internets! Doesn't this effectively kill the ability for the Xbox One S to stream 4k/HDR to your TV now, since it's going through a splitter rated only for 1080p? 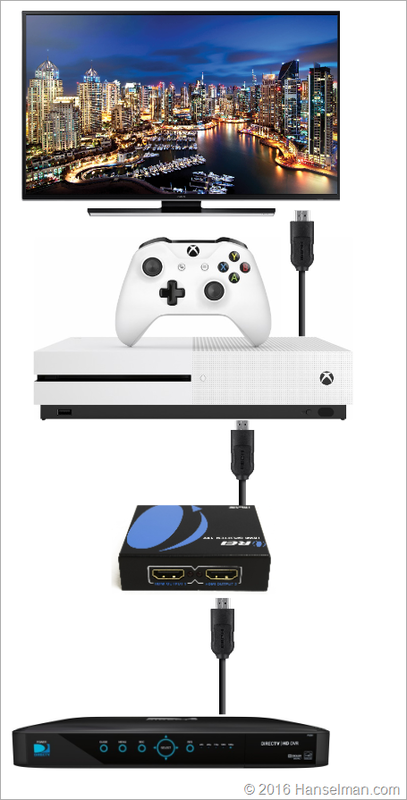 I used to have the exact same setup (before the splitter) but I disconnected the DirecTV from the xbox because after a while the TV feed would start to get all "jumpy" like it was dropping frames or something. Rebooting the Xbox (cold) usually made things go back to normal for a while. I wonder if the splitter will correct that problem? It's worth a try for $20. Technically, its a powered 2 port HDMI splitter, since there is an external power source that's included, but not shown in the default picture. Meaning that you do need an available power outlet nearby. @Rick - I've had that problem of a "jumpy" or stuttering TV picture. All you have to do is quit the TV app and restart it (really quick), no need to reboot the entire Xbox One (which takes forever). @Damian, if you need 4K support, there's the OREI HDS-102 model for $2 more. This is a great example of all that's wrong with tech. I think the moral of the story is that IS the XBox's fault for being so finicky. If a $20 splitter from Amazon can work, so should your $300 XBox, period. Seems like another case of DRM to protect industry profits being put above the consumer experience. Sam I disagree. The DIRECTV is 10 years old and out of spec. The Xbox is in spec. There's no DRM involved here. The splitter is new and in spec. I have this same setup with the same 2 port splitter (except instead of direct tv I have my laptop passthrough my xbox one to my 50" tv). And similarly, the signal doesn't work going straight through without it. I wasn't quite sure why it was working but this makes a lot of sense. Strongly considering running my cable hookup in the den through my Xbox One. I'm probably on Xbox One as often as I'm watching TV, anyway. I thought that slitter was well known to remove HDCP (DRM) from the HDMI Signal? Interested to know what the actual HDMI compliance issue was between the DIRECT TV and the XBOX was because the whole issue seems to be a bit fishy. I recently found that setting up Storage Spaces or using the Windows software RAID mirror can be useful for getting in front of dead drives. It's not a substitute for offsite backups, but if you have an older hard drive that will inevitably fail, it's cheap insurance. Buy a bigger drive for the mirror and you'll have something nicer to migrate too after failure as well.Advice? Have debated putting my direct tv behind the xbox one in a similar setup. What does it give you that you don't get directly connected? I thought most of HDTV has more than one HDMI ports, so that it can connect to different consoles (Xbox, HDTV receiver, computer etc). @Chris - I have used both Dish and DirectTV through my XBOX and I would never consider going back. Having the XBOX control everything means that I only have one box I need to control and it takes care of switching everything else as needed. There are other ways to achieve this, like using a Logitech Harmony remote, but I found the XBOX setup to be much easier to configure, and much less error prone in operation.